Last weekend, I built a solar over and tried to make sun-dried tomatoes in them. 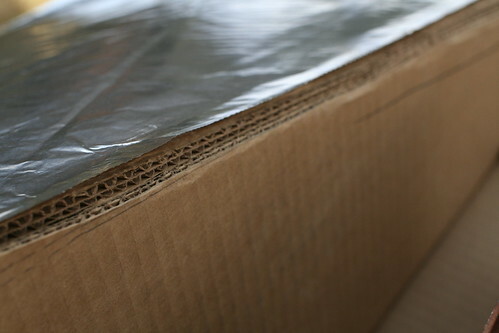 Two cardboard boxes, one slightly smaller than the other. A piece of glass or clear plastic. I used clear plastic because I figured for first attempt best to learn on something that does not break easy. Old issues of the New Times, specifically the ads for the strip joints in the back, because this is going to get hot! Some other stuff that will be obvious. Step 1: Figure out the angle you want, generally 30% in summer and 70% in winter. Step 2: Cut larger box at that angle desired. Fold flaps back and cover with tin-foil, the flatter the better. Be generous with the glue at the edges. Step 3: Cut smaller box at same angle. Smaller box is to fit into larger box eventually. 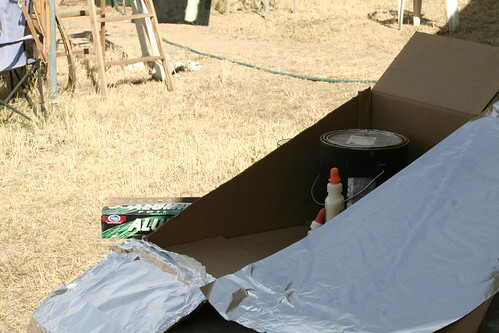 Step 4: Line inner box with tin-foil. Step 5: Place smaller box in larger box, use old New Times to insulate the oven by placeing crumbled snewspaper sheets between the boxes. 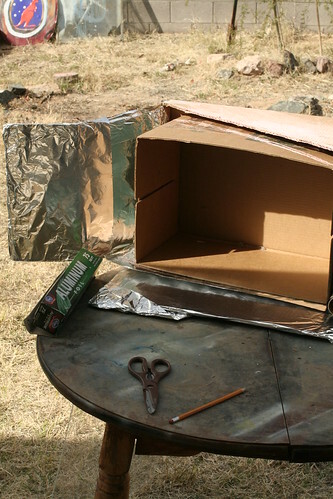 Step 6: Place box at angle to get sun, best if box is portable. Cover box with clear plastic. Step 6: Watching a pot boil in the sun takes forever. First time around I hit about 150″, it was about 70″ degrees outside. I cooked tomatoes and tried to boil water. Water never even came close to boiling, but would have made a nice tea. 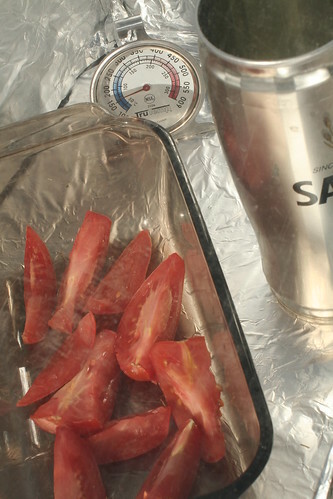 In four hours the tomatoes were slightly dried out but not dried out for preservation. Temperature wise it did not seem to matter if I use glass or a sheet of clear plastic. Some videos I had watched said they had gotten the temp. to 250 degrees, so I have a lot of room for improvement. The glass was not flush with the box, so that is where I would begin working on improvements. You might consider using a some black material, black construction paper, for instance, to line the bottom to absorb heat and also so that the light is not reflected back out of your oven by the foil on the bottom. 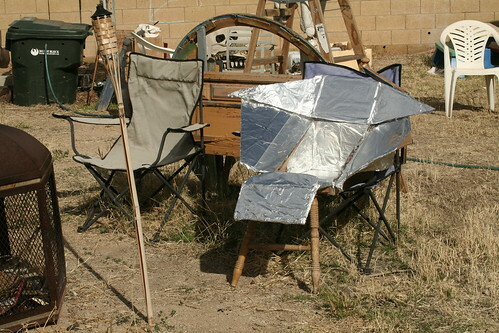 Don’t remove the foil, though, as it is good at reflecting the heat back so you don’t loose as much. Also, you might consider double layering your glass/plastic and make sure your reflector panels are giving maximum reflection into your oven. Hope that helps. I did try to double layer and it did not seem to have much of an impact. Good idea using black material for the bottom, I am keeping an eye out for black sheets of metal to put on the bottom. Oh, also once you are above 150, that should be enough to kill off the bad things in your water. I went and found an article on it that you might like. They are using some device I’ve never seen before called a WAPI to indicate safe, germ free water. Great link! I am surprised 150 would be hot enough, thanks for sharing!